CHR352. Ministry Leadership and Management is a survey of principles and practices of leadership and management in the local church. Prerequisite: CHR250 or permission of instructor. CHR472. Special Topics in Preaching is a study of advanced topics in Christian preaching including hermeneutics, sermon forms, and delivery techniques. Prerequisite: CHR362. Dr. Chuck Fuller comes to Anderson University with 13 years of experience in pastoral ministry, serving churches in Kentucky and Indiana. 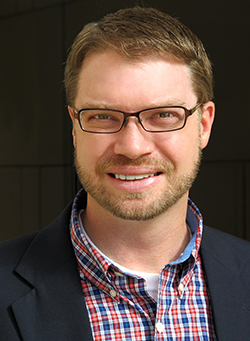 He holds a BA in Christian Studies from Campbellsville University, and an MDiv and PhD from The Southern Baptist Theological Seminary in Louisville, Kentucky. His primary field of study for the Ph.D. was in Christian preaching, with additional studies in systematic theology and philosophy. Before arriving at AU, Dr. Fuller was pastor at Bethany Baptist Church in Louisville, Kentucky, and adjunct professor of Christian preaching at Boyce College of The Southern Baptist Theological Seminary. Additionally, Dr. Fuller has served on committees and boards of the Kentucky Baptist Convention. Married to Jessie, Dr. Fuller and his wife have two children–Kaylen Marie and Ian Charles. Jessie holds a Bachelor of Bible from Ozark Christian College, with a concentration in deaf ministry. Currently, Jessie works as a stay-at-home mom and brilliant culinary artist. Homiletical theology comprises Dr. Fuller’s primary research area, as demonstrated in his recent book, The Trouble With “Truth Through Personality”: Phillips Brooks, Incarnation, and the Evangelical Boundaries of Preaching. Dr. Fuller also presented a paper, titled “The Pulpit at the Precipice of Heresy,” at the 2010 meeting of the Evangelical Homiletical Society. I am at Anderson University to mentor future pastors to serve the local church faithfully. My passion is to help raise a generation of God-called ministers who will bind their minds (and their preaching!) to the text of Scripture, who will grasp deeply and live fully the gospel of Jesus Christ, who will lead congregations to kingdom growth in unity and doctrinal fidelity, and who will patiently and lovingly shepherd the flock of God. I want to teach the principles and practices of faithful ministry in the classroom, but also serve as a mentor to our ministry students and minister to the AU community.